Description: A classic boudoir accent chair that can give the design of any room some flair. A smooth and elegant back frame on sweeping back posts with tapered, block-turned front legs. 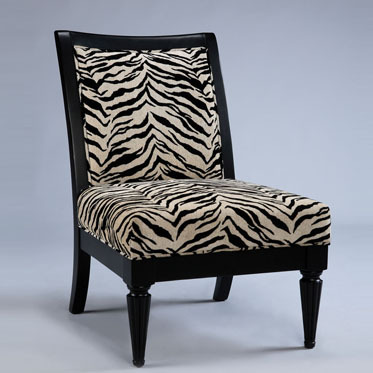 Its black finish perfectly frames the white tiger striped cover; pattern color onyx, 82% rayon and 18% polyester. Local price $375.00. Out of state add shipping fees.